Post sponsored by California Pear. See below for more details. There’s nothing quite like the feeling of driving down interstate 5 from Sacramento and seeing all the produce grown. It can be humbling to drive among the various orchards and realize just how much produce is produced on the valley floor. I’m excited to partner again with California Pear for the harvest season. I’ll be highlighting a few new pear recipes this season. About 60 multi-generational family farms will produce about 2 million 36-pound boxes of Bartlett pears and 500,000 boxes of a variety of California-grown pears, including Seckel, Bosc, French Butter, and Comice. The California Pear season is officially under way, making these pears the first U.S. pears to hit the market. 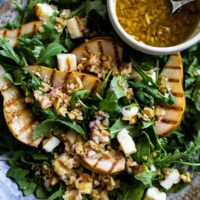 I know pears are usually thought of as a fall treat but having them in July is pretty magical (like in this grilled pear salad!) 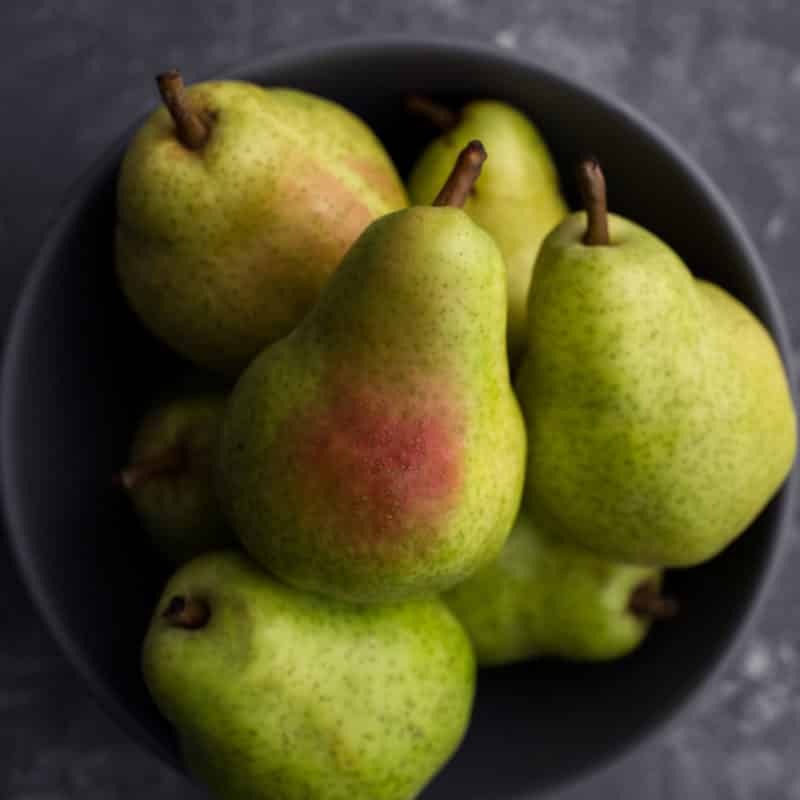 When you head into your grocery store, be sure to look for the label ‘California Grown’ to pick up a fresh, locally grown pear. Grains: For an extra boost, add a cup or so of cooked grains. Farro, quinoa, or sorghum. This salad is versatile enough that most grains work. Bread: I’m a sucker for a salad with croutons and this one would be perfect with homemade croutons. Just a heads-up though, add a bit more dressing so that it can soak into the bread. Cheese: Swap out the halloumi for another solid salad cheese like crumbled gorgonzola or feta. If you’re using feta, try your hand at grilling it! As mentioned above, July marks the start of California pear season. Fresh pears are perfect in salads, on pizza, and of course, as dessert. Bartlett pears come in first and the crisp, fresh flavor is perfect for the hot July temps. Below are a few of my favorite ways to use fresh California pears. Quarter the pears in half and with a paring knife, remove the seeds. Drain and rinse the halloumi then cut into thick slices. Rub both the pear and halloumi with olive oil. Place on the grill and cook until both are charred. Chop the halloumi into bite-sized pieces. 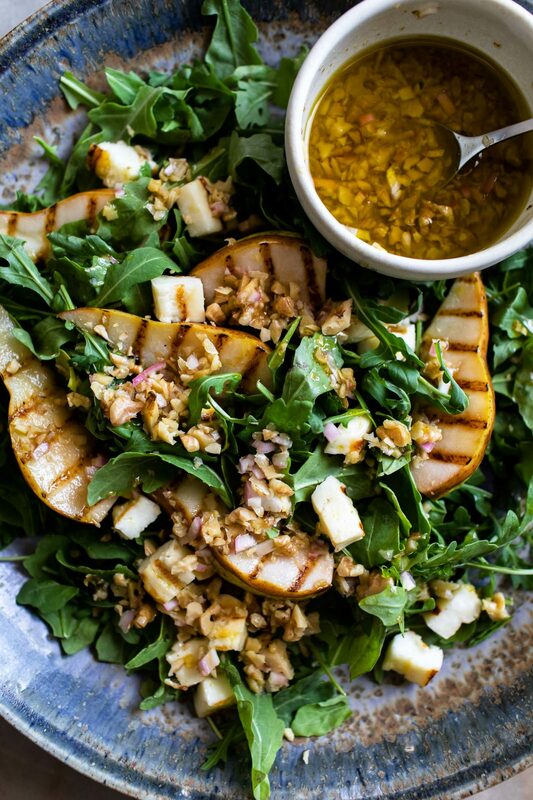 While the pears are grilling, make the dressing. Toast the walnuts by placing them in a dry skillet over medium heat. Shake the pan and cook the walnuts until fragrant; 3 to 4 minutes. Remove, let cool, then chop. Place the walnuts in a jar along with the ingredients for the dressing. Shake well. 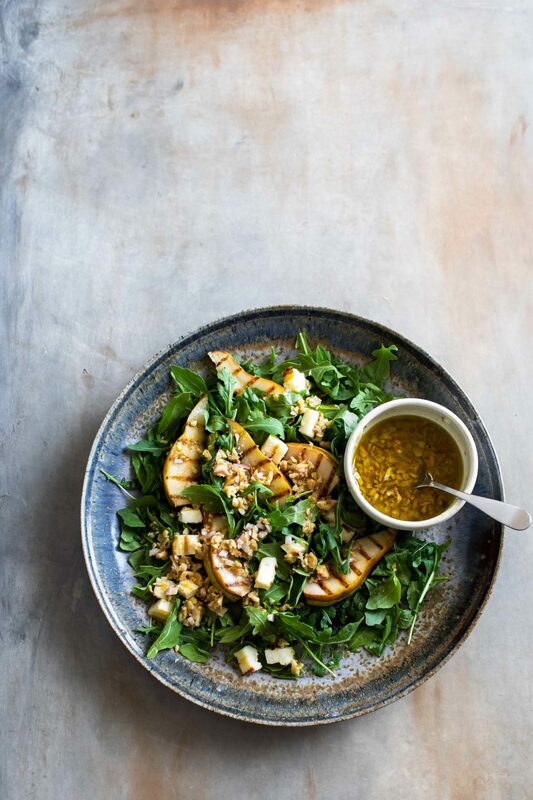 Assemble the salad with the pears, halloumi, arugula, and dressing. Serve with crusty bread. Tips and Tricks: Bartletts work best for this salad as they can be heated with keeping a bit of crisp texture. The goal is to char the outside and keep the pear slices on the thicker side. Disclosure: This recipe was created in partnership with California Pears. All thoughts and opinions are my own. It’s content like this that helps me keep this site running to provide the vegetarian recipes you see every week.